Writing in the latest TIME magazine issue (Oct. 6), Rana Foroohar explains why the U.S. economy is in deep trouble – and why many are distressed that nobody seems to be tackling the core issues. Foroohar says it has taken 41 months to replace the jobs lost in the “Great Recession” (2008-11). This is more than three years, far longer than in previous recessions. But, which jobs?? Mostly, burger flippers, at $8/hr. “That’s a problem in an economy that’s made up chiefly of consumer spending. When the majority of people don’t have more money, they can’t spend more, and companies can’t create more jobs higher up the food chain. So, poor job creation and flat wages are holding back a stronger recovery in consumer spending. Foroohar concludes: “If this trend is left unchecked, we are looking at a generation that will be permanently less well off than their parents.” This is disastrous, because there is an intergenerational contract, in which older generations offer younger generations the hope of better lives, jobs and strong futures. This is the first time the opposite is the case. We are giving our children a far worse economy and society than the ones we received. This is by far the core issue today facing America –not ISIL. Let’s focus on the real issues. America’s real enemy is at home, not abroad – its own failing economy. A general estimates the war on ISIL could cost as much as $10 b. This is money needed for schools, colleges, research, innovation and technology. ISIL, the Islamic State, is hurting America deeply simply by diverting resources into jet fuel, smart bombs and cruise missiles. Boots on the ground? America needs special forces to ‘light up’ with lasers the true problem – education, poverty, and above all, low-wage jobs. A friend drew my attention to an article in Chronicles of Higher Education, by Tom Bartlett, Sept. 29, about the utter lack of humor in scientific research proposals, and in general, among scientists. (An exception is the late Nobel physicist, Richard Feynman, whose book was titled, Mr. Feynman, You Must Be Joking!). Bartlett asked the editor of the leading economics journal, American Economic Review, whether “she could think of any joke, any tiny moment of amusement, one solitary witticism that has passed across her desk. Anything, even if it was rejected.” “I can’t think of a single thing,” replied Prof. Goldberg, confirming economics’ nickname as the ‘dismal science’. Why is this a problem? Why shouldn’t science be utterly serious? Isn’t humor frivolous? The answer is no. Research on creativity shows that among people seeking ideas, humor, and in general a light, playful attitude, are powerful contributors to an ambience that generates great ideas. Show me a stiff, and I’ll show you someone without ideas, in all likelihood. That reviewer reminds us of the two old grumps in The Muppets, whose total lack of humor was in itself hilarious. I myself encountered this, in submitting research papers; anything in my writing style that sought to be interesting, journalistic, was instantly shot down, like a shoulder-guided missile homing in on a helicopter. Hey, reviewers! Lighten up! Loosen up! We need new thinking, new ideas. Absence of humor often means absence of open-ness to anything unusual or weird. 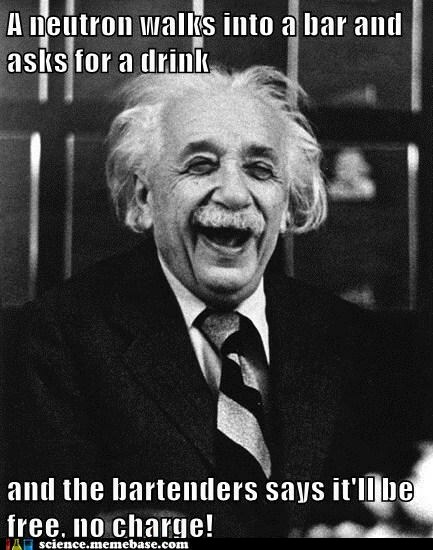 Even Einstein told jokes (bad ones – see above). Carmen Sigarra is a veteran lawyer, who worked for the Federal Reserve, overseeing banking operations, specifically Goldman Sachs. She was fired and is now suing the Fed. During her stay at the Fed, she recorded nearly 50 hours of sessions in which Fed examiners checked Goldman Sachs transactions. She has now released these tapes, and they will be the subject of an upcoming episode of This American Life, on PBS (American public radio). Don’t miss it! What emerges is a picture of lax regulators, overly delicate with how they treat Wall St. Big Money, especially Goldman Sachs. It demonstrates the culpability of the Fed in the 2008 financial collapse and crisis. Blame the Fed is the title of an article I published in Barron’s, and these tapes confirm it. 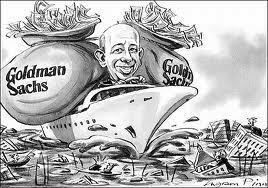 Blame Goldman Sachs too – they are not blameless. Specifically, one transaction that illustrates the whole picture was this: the embattled Spanish bank Santander was being pressed by European regulators to boost its capital – that is, to have more liquid cash on hand, in case its assets declined in value. To avoid doing this, Santander needed to get some assets off its books. So it asked Goldman Sachs to babysit them – keep the assets on Goldman’s books. For a hefty fee, of course. Goldman agreed… it’s legal, (but shady, said the Fed examiner. Legal, but shady. That is the mantra of many people on Wall St.). Goldman attached a clause: The transaction was subject to Fed approval. So the Fed could have killed this ‘shady’ transaction. But of course they didn’t. And it went ahead. And so did many many many other similar, much worse transactions. What do we learn? Wall St. has immense power. The alleged independence of the regulators, the Fed, is a fiction. This is why another financial collapse, totally different in nature, could well occur. As a child, I recall listening to The Lone Ranger on the radio. The Lone Ranger wasn’t alone; his Indian friend Kemo Sabe rode with him. Together they fought evil, injustice, crime and helped the helpless. 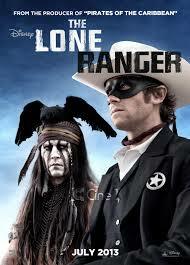 Today America is again The Lone Ranger. Ebola outbreak? America sends 3,000 soldiers to set up as many as 17 emergency treatment centers in Liberia. Why? No other country can or will. And Ebola is a threat to all of Africa and perhaps the world. Liberia is an entire nation under lock-down! And health workers and journalists are murdered in Guinea, by suspicious villagers who think they are bringing the disease rather than fighting it. ISIS? (Obama is right. It is really ISIL, Islamic State in the Levant, because ISIL believes they will establish the Caliphate throughout the Mideast, including Lebanon and Israel. What you call things DOES matter!). America to the rescue, leading a ‘coalition’, but have no doubt, most of the military action will be American. Because Europe has given up defense spending and prefers to shelter under American defense spending. If there is a major humanitarian disaster somewhere in the world, that takes resources and abilities, it will be largely America to the rescue. So, yes, we can criticize America, Americans and their leader President Obama. But as many have noted, at present there is no other country who can come close to replacing America, in its will and ability to come to the rescue, like The Lone Ranger. And yes, America does stumble, fail to fully understand the cultures in which it operates, and yes, it does endlessly debate its decisions to intervene abroad. But in the end, like The Long Ranger, America is there. So – thanks, America. We really do give you a bad rap. The Standard & Poor 500, the broad index of Americna stocks, has set new records this summer. This, despite the flagging U.S. economy, an unpopular President, gridlock in Congress, and mountains of cash held abroad by U.S. multinationals, stubbornly refusing to invest it in their own country. What is going on? Is it a bubble? Andrew Davis has a simple answer. Stock buy-backs. Personally I would not invest in companies that have nothing better to do (R&D, innovation, HR, infrastructure, facilities, IT) with their cash than curry short-term favor with myopic shareholders by artificially pumping up their own stock price. When I tell this to CEO’s, they frown, or worse – but they agree, in their heart of hearts. They simply feel they have no choice but to buckle under shareholder pressure. They DO have a choice. Present a capital investment program. Invest when other companies are afraid to. Then, when the recovery finally comes, you will have a major competitive advantage — and your stock price will rise for the right reasons. 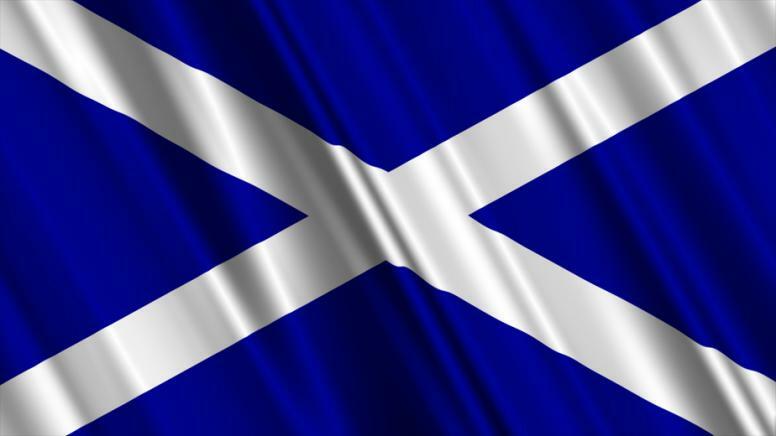 The Scottish flag, chosen by the Scottish Parliament in 2003 (yes, there is such a thing) is very beautiful; it forms part of the flag of the United Kingdom and Northern Ireland. (There was a huge debate over the precise color of blue). Today the Scots are voting on independence. The vote is very close. It is roughly even. Some 4.2 million Scots men and women have registered to vote, or 97 per cent of the voting age population aged 16 and over (yes, 16 and 17 year olds can vote!). It is expected that at least 80 percent will vote. I predict the ‘no’s’ will win, by a small margin. There is fierce controversy. 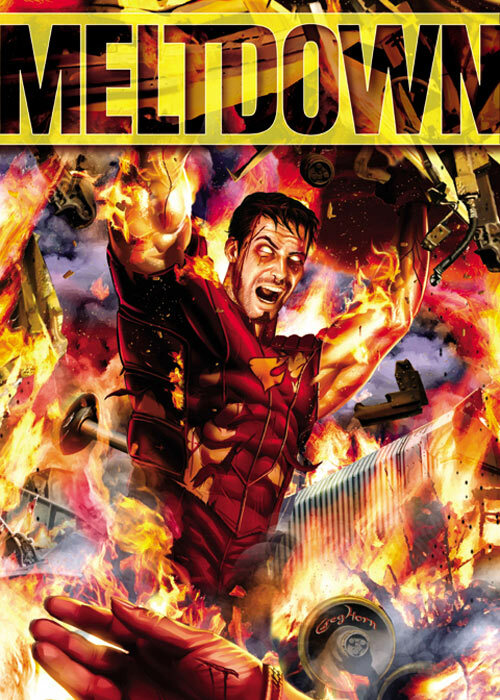 UK Prime Minister David Cameron predicts apocalypse, catastrophe, if the vote is “yes”. And just a one-vote margin in favor of yes will do the trick. There are many who favor a ‘yes’ vote and independence, predicting utopia. Smack in between. The truth is, it makes almost no difference whether Scotland is an independent nation or remains a part of the UK. Why? If “yes”, it will retain the British currency, the pound, trade with Britain, remain part of the EU… basically nothing of importance will change. What will change is that Scotland will be formally, nominally and independent country. So? Who cares what you call it? What matters to the people of Scotland is their wellbeing and standard of living. And that simply will not change. So, don’t believe the hysteria. Neither ‘yes’ nor ‘no’ vote hysteria is right. Scotland is part of a broader geopolitical picture – the fact that increasingly politics is local, while business is global. The reason is, many regions feel they can do better without the burden of the lazy bureaucrats in the central government. And there is some evidence. Slovenia divorced Yugoslavia, just in the nick of time, and has done super-well. Bangla Desh divorced Pakistan, and has not done so well, though arguably better than Pakistan. Quebec did NOT divorce itself from Canada; if it had, it would really not have mattered, business would have remained global (Canada wide). What about Scotland’s vast oil wealth? It’s not really wealth; it is leased by big oil and Scotland gets royalties, not that much, because this oil is among the most expensive in the world to pump from under the sea. What about Britain’s nuclear naval base in Scotland? It won’t change; it will be leased. Who owns the RAF jet fighters based in Scotland? Well, who the heck cares? Let the politicians on both sides babble on. Business, trade, economics are global. They disregard borders these days. So whether or not there is an imaginary border between Scotland and England matters not at all. The rich are getting richer in the United States, surely, but the real problem, says this former business school dean, is who exactly is getting mega-rich and how. It’s not the capitalists (that is, the shareholders and investors). It’s the speculators (the people who manage their money). The top 25 hedge fund managers in 2010 raked in four times the earnings of all the CEOs of the Fortune 500 combined. How come? Through a once-obscure mechanism called the “2&20 formula.” Derived from a 2,000-year-old practice whereby Phoenician ship captains took 20% of the value of a cargo successfully delivered, it’s the formula that governs how hedge fund managers are compensated — a 20% cut of the profits generated (taxed at the 15% capital gains rate) on top of a 2% asset management fee. And what are those 25 people doing? They’re borrowing stock, holding it for sometimes less than five minutes, and creating and profiting from the resulting volatility. This problem can be fixed with tax laws that penalize high-frequency trading and require the profits to be taxed as income, and concerted efforts among pension and endowment funds to stop lending the overpriced hedge fund managers the stock they’re playing with. What are the chances the U.S. Congress will fix the problem? With obstructionist Republicans calling the tune, and with November elections upcoming, with the Democrats in danger of losing control of the Senate – less than zero. Three eminent economists – Richard Layard, John Helliwell and Jeffrey Sachs – combine to prepare an annual World Happiness Report. Their measure is based on self-assessed happiness, interpreted as “satisfaction with life” together with the perceived emotion of wellbeing. 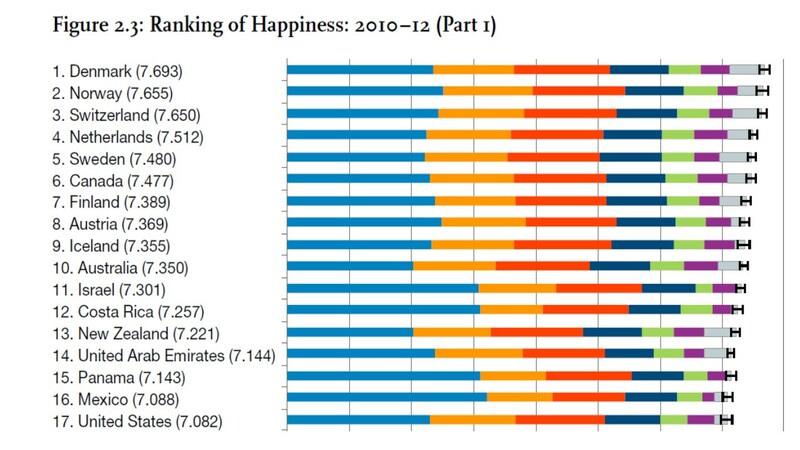 In their latest report, for the years 2010-12, (see above), Scandinavian and Northern European countries rank highest, along with Canada, Austria, and surprisingly, my country Israel (11th), despite the Mideast conflict, and Costa Rica, a relatively poor but serene and beautiful country. Note that Mexico, at 16th, ranks above the United States, despite the latter’s $50,000 GDP per capita. Why? The answer is simple. Happiness, note the authors, is driven in part by the standard of living (per capita GDP), but also by life expectancy, social support, freedom to make life choices, and generosity. This is why Qatar, the wealthiest country in the world by far, with per capita GDP of nearly $100,000, ranks only 27th, because it is a rigid autocracy. I am amazed at how poorly individuals and whole nations practice the simple art of best-practice benchmarking. If you are a political leader, and if your avowed goal is to improve the wellbeing of your citizens, the ones who elected you, would you not explore the world and visit the places in which people are the happiest, and try to find out why? And would you not try to bring home some of the “recipes” they use – income equality, social support, generosity, social cohesion? I get this response very often when I make this argument: Israel is not Denmark. Followed by all the excuses. And my response is: Well – why isn’t it? Can we make it so? There is a lesson for individuals in this Report, not just for countries. True, you do need a basic level of income to be happy. But you also need the love and support of family, the generosity of others, and good health (supplied, as a public good “health care”, by good governments, or at least they should). Even if you have high income, if you lack the other ingredients, the income may not help much. Keep this in mind. IMD (a leading European business school based in Lausanne, Switzerland) Professor Arturo Bris offers eight reasons why a financial and economic meltdown in 2015 is likely. He may be wrong – but we should all be aware of the underlying danger signals. Forewarned is forearmed, or, as the Boy Scouts say, “be prepared”. Stock market bubble: equities rose 18 percent between June 2013 and June 2014. Bob Shiller (Yale) says the gap between stock prices and corporate earnings is larger than it was in the crisis periods of 2000 and 2007. Why the bubble? Because there is just so much money, those who hold it are desperate to put it SOMEwhere… no matter what. Chinese banking system: Need more be said? Energy crisis: If the US Congress allows energy exports, it could crash the price for oil, and sink Russia and other oil-reliant countries. This could lead to violence. 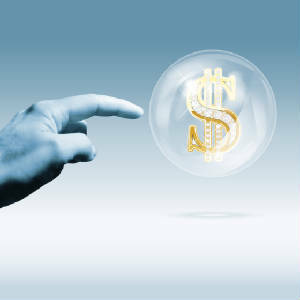 New real estate bubble: The housing bubble is back – low interest rates, rising real estate prices in many markets. Corporate failures: Corporate debt is now rated, on average, BBB. This means that in the next 5 years about 16 companies in the S&P 500 will go bankrupt. This could have major impact. Geopolitical crisis: The world is a huge mess, with civil wars raging in the Mideast and elsewhere. Poverty crisis: The number of people in the world living in abject poverty grows. This is dangerous; because desperate people may do desperate things. Cash crisis: There is simply too much money out there. Central banks have printed enormous amounts of cash, and it is floating around the world. Some banks and some companies are so rich they could buy entire companies (anyone want to buy Israel? Jamaica?). Right now that money is just sitting. If it starts to move, if its velocity rises, we may get huge problems. This is the sad story about how a shortage of resources, and the system of competitive funding of research grants through peer-review, is ruining U.S. science and killing scientists’ motivation. I heard it today on America’s National Public Radio News, in a report by Richard Harris. Ian Glomski thought he was going to make a difference in the fight to protect people from deadly anthrax germs. He had done everything right – attended one top university, landed an assistant professorship at another. But Glomski ran head-on into an unpleasant reality: These days, the scramble for money to conduct research has become stultifying. So, he’s giving up on science. Ian Glomski outside his home in Charlottesville, Va. He quit an academic career in microbiology to start a liquor distillery. Why is he giving up???? Because to get grants, you need to ‘tweak’ safe existing ideas, so your peers will approve it; because if you have radical ideas, your peers who judge the grants competition will shoot them down, because if you succeed, those ideas will endanger the judges’ own safe, conventional, non-risky research. Glomski wanted to study anthrax ‘in vitro’, in live animals, using scanning techniques. Today it’s done by analyzing tissues of dead animals. His idea might have failed. But if it succeeded, it could have utterly changed our understanding of anthrax and other such diseases. In theory, peer-review of grants is fair. But it fosters extreme mediocrity. 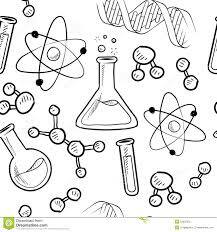 And as government funding of research declines, (20% cut in recent years), competition gets fierce (1 of 8 grant proposals is successful, and it takes long stretches of time to prepare one – so young scientists spend their time writing proposals rather than doing effective research). 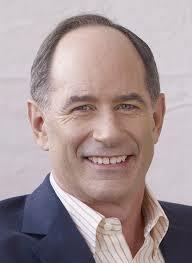 Harris reports that “…. payoffs in science come from out of the blue – oddball ideas or unexpected byways. Glomski says that’s what research was like for him as he was getting his Ph.D. at the University of California, Berkeley. His lab leader there got funding to probe the frontiers. But Glomski sees that far-sighted approach disappearing today.” Playing it safe will never generate the creative breakthroughs we need. As with many things in America, scientific research is utterly screwed up. And it is unlike to change in the near future.